This IBM® Redpaper™ publication describes the adapter-based virtualization capabilities that are being deployed in high-end IBM POWER7+™ processor-based servers. Peripheral Component Interconnect Express (PCIe) single root I/O virtualization (SR-IOV) is a virtualization technology on IBM Power Systems servers. SR-IOV allows multiple logical partitions (LPARs) to share a PCIe adapter with little or no run time involvement of a hypervisor or other virtualization intermediary. 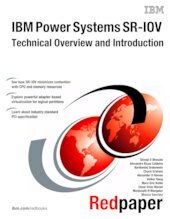 SR-IOV does not replace the existing virtualization capabilities that are offered as part of the IBM PowerVM® offerings. Rather, SR-IOV compliments them with additional capabilities. This paper is directed to clients, IBM Business Partners, and system administrators who are involved with planning, deploying, configuring, and maintaining key virtualization technologies.